Very recently Mövenpick Hotel Mactan Island Cebu opens “Thai Fun Food Festival” at The Sails restaurant wherein diners will have a chance to win a round-trip ticket to Phuket, Thailand courtesy of Cebu Pacific, inclusive of two nights hotel stay at its sister hotel, Mövenpick Resort & Spa Karon Beach Phuket. In between courses, I flexed some muscles to make room for more spicy food! Everyday from September 10-18, 2016, The Sails will showcase the best of Thailand cuisine prepared by real Thai chefs from Mövenpick Resort & Spa Karon Beach Phuket. The three guest chefs will be seen in action around The Sails, cooking and serving authentic and diverse specialities that reflect the Thai culture, ingenuity and tradition. It’s difficult to choose if I should have Tom Yum Soup or Chicken with Coconut Milk so have I have both. Chef Christian Bouby, the executive chef, is proud to put the spotlight on the three guest chefs from Phuket, Thailand, namely Wiwat Yong-en, Sutee Yamkratho and Teenasit Nakrua. With this alone, the trip to Movenpick is already worth it. The salad and appetizers were big teasers. Another stellar dish from Thailand. I usually make Thai Beef Salad at home. Thai food is always a food adventure. How can I forget you? I will go back to Movenpick just for this. Dessert? My favorite of course is Thai’s Sticky Rice. I really don’t know why I can’t hack it at home. 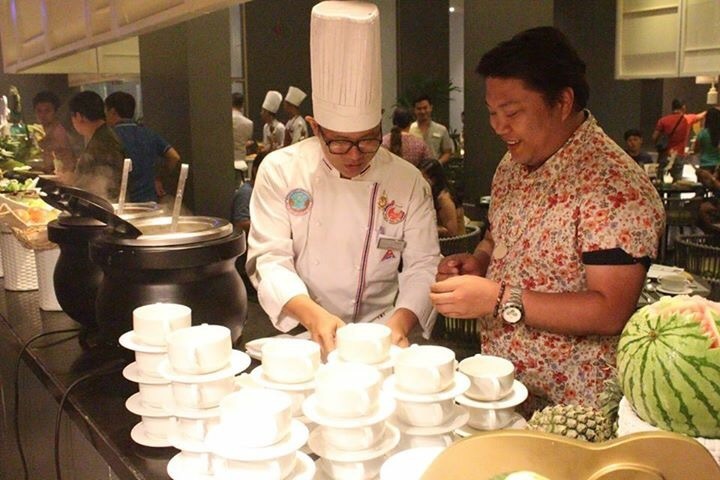 Dinner buffet is at PHP1,600 nett per person.